Will Super Mario play Santa Claus today? Markets will be watching for an early holiday gift from the European Central Bank. 1. More stimulus? There's a slim chance the ECB will use its last meeting of the year to announce more help for the stagnant eurozone economy. More likely is a strong hint, perhaps even a promise, from President Mario Draghi of more action to come early in 2015. The central bank will cut its forecasts for eurozone growth and inflation at Thursday's meeting. Most major European markets were narrowly firmer in early trading. The euro was becalmed versus the dollar, having lost 10% so far this year to trade at a two-year low. Asian markets posted clear gains. 2. Oil prices steady: After a turbulent few weeks, oil prices look to be stabilizing. U.S. crude futures were slightly higher at nearly $68 a barrel. The sharp fall this year is damaging high cost producers but generating a windfall for consumers and drivers. Gas prices for a lucky few have even fallen below $2 a gallon. 3. Earnings and economics: Dollar General (DG) and Sears (SHLD) will report quarterly earnings before the opening bell. American Eagle (AEO) and gun maker Smith & Wesson (SWHC) will report after the close. The U.S. government will report weekly jobless claims at 8:30 a.m. ET. 4. Stock market movers -- General Motors: Shares in GM (GM) were trading about 2% firmer premarket. News about GM has improved recently after a months of damaging recall headlines. Car sales are strong and the mid-sized Chevrolet Colorado won Motor Trend's 2015 Truck of the Year award, beating Ford's new F-150. 5. Futures flat: U.S. stock futures were little changed. U.S. stocks rose to new record highs again Wednesday. 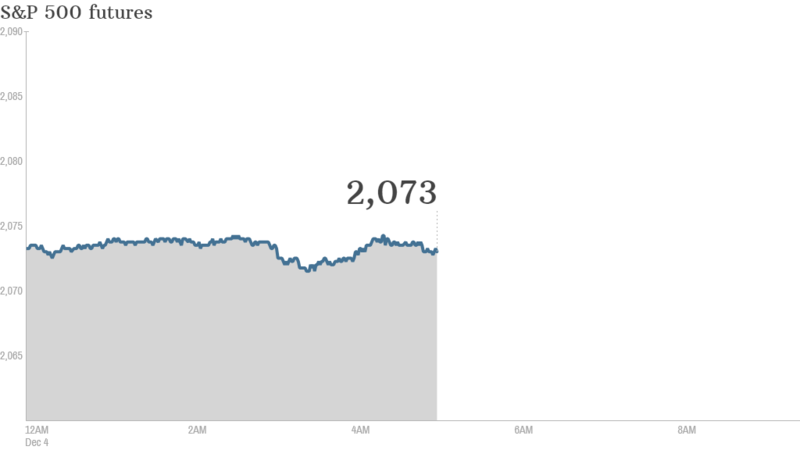 The Dow gained 33 points and landed above 17,900 for the first time. The S&P 500 and Nasdaq both closed 0.4% higher.